The Model DT-520 is a versatile steel-rule die, lever press-style sample cutter. Inserting interchangeable steel-rule dies into the press allows preparation of various film and sheet sample shapes for a range of test instruments including tensile testers, elmendorf tear testers, permeation instruments, shrinkage testers, and many others. 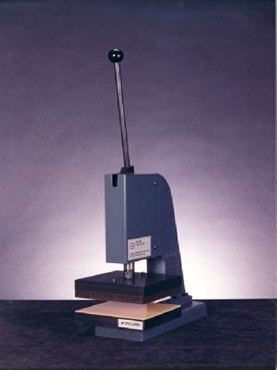 Can cut samples up to 6 inch X 6 inch size; lever press rated to withstand 4000 lb force.